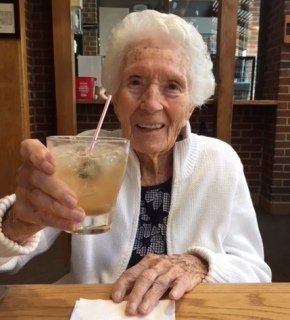 Evelyn (Squier) Brandt, age 97, of Roanoke, VA passed away on Tuesday, March 19, 2019. Born in East Orange, NJ and raised in Belleville, she resided in Hackensack and Brick, NJ before moving to Roanoke ten years ago. A 1943 graduate of Mary Washington College with a Bachelor’s Degree in Home Economics, she earned a Master’s Degree in education from Montclair State University in 1975. While raising her family, she was an active member of the 3rd Reformed Church in Hackensack, NJ and most recently a member of Covenant Presbyterian Church in Roanoke, VA. Her home was always open to friends of all ages and everyone knew that tea and dessert was served at 9:00 pm. In her spare time Evelyn enjoyed swimming, sewing, needlepoint, and working crossword puzzles. Prior to retiring in 1986, she taught for over 25 years in the Tenafly, Saddle Brook, and Fair Lawn school systems. Her friendships with fellow teachers continued well into her golden years. Beloved wife of the late Richard Donald Brandt. Loving and devoted mother of Carolyn Ward (husband Bob) and Catherine Osborn (husband Jon). Cherished grandmother of Jonathan Ward (wife Cheryl) and Dane Osborn. Proud great-grandmother of Noah Ward. Sister of the late Dorothy Browne. The family will receive relatives and friends Monday, March 25, 2019, 4-7:00 pm at Vander Plaat-Caggiano Funeral Home. A funeral service is planned for Tuesday, March 26, 2019, 10:00 am at the funeral home. Interment will follow at George Washington Memorial Park in Paramus. In lieu of flowers, donations in memory of Evelyn to St. Jude Children’s Research Hospital www.stjude.org or the American Cancer Society www.cancer.org would be appreciated.